Can a plane really just vanish? The missing Malaysian jetliner MH370 was last seen heading towards Pakistan. Investigators say the missing Malaysia Airlines jet was hijacked, steered off-course and could have reached Pakistan. The representative said that hijacking theory was now ‘conclusive’, and, as a result, police have raided the luxury homes of both the captain and the co-pilot. Zahari Ahmad Shah, 53, the pilot, and Fariq Abdul Hamid, 27, are now being investigated as police in Kuala Lumpur search for signs of foul play. 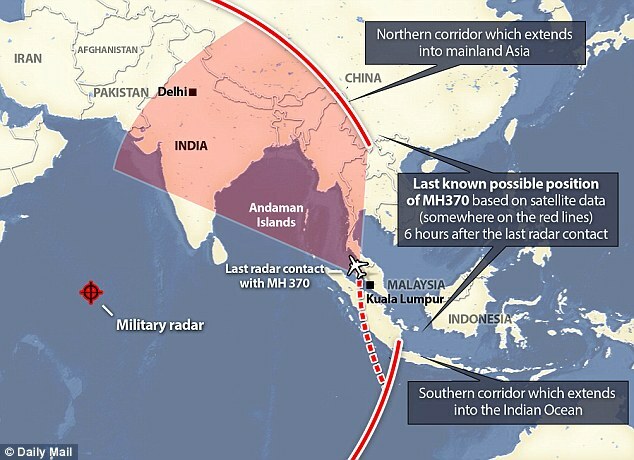 The search operation has now been focused on two ‘corridors’, one which extends from north west from Thailand to the Kazakstan-Turkmenistan border and the other which opens out into the southern Indian Ocean. Countries in the plane’s potential flightpath have now joined a huge diplomatic effort to locate the missing passengers, but China described the revelation as ‘painfully belated’. The plane’s communication system was switched off as it headed west over the Malaysian seaboard and could have flown for another seven hours on its fuel reserves. It is not yet clear where the plane could have been taken, however Mr Razak said the most recent satellite data suggests the plane could have headed to one of two possible flight corridors.